This complex sampler was one of the first live looping tools from which the notion of the loop pedal evolved. Guitar pedal giants DigiTech termed their string of looping pedals following this older legend. Four hardy footswitches take up most of the surface. One begins playing or recording loops, other works as a stop switch that can also be employed to adjust the tempo. Speaking of those card banks, the pedal includes 99 of them, each one capable to keep a loop, for a total of up to 35 minutes of recorded loops. As though this was not sufficient, the pedal carries an SD card which grants another 99 banks. This is a signature characteristic of the JamMan that makes it easy to transfer, upload, and also download loops to your JamMan.
. The back rows of controls may seem complicated at first glance, but the lights and labels make it easy to understand what exactly does. Plugging one in expands your controls for loop tempo and reverse playback, and gives you immediate undo/redo functions. Right off the bat, you may have noticed the similarity in look between the JamMan and Boss’s RC-20XL. You are certainly not alone. The RC-20XL came out in August 2004, and the JamMan a year later, to the month. This leads to a lot of competition between the two pedals, and they are in many ways easily comparable. DigiTech has since released a couple of new pedals, the JamMan Solo, the JamMan Stereo, and the Jamman Delay, but then again, so has Boss with it’s RC-3x series. The manufacturing competition between Digitech and Boss does stand out, and they’re alike in more ways than just looks. In actuality, both manufacturers offer us loopers with a lot of the very same functions. The key to choosing between the two is simply to establish the differences and take your choice. general information about looping, click here. Memory To store your loops the JamMan gives you 99 places, which are saved on a Compact Flash card. With the device you get a 128MB card, which is good for around 24 minutes of recording time, but you can get cards of up to 2GB, which provide over half an hour of storage period. This is one of the principal differences between the JamMan and the RC-20XL, and it’s one where the JamMan really does exceed the competition. The RC-20XL only offers sixteen minutes of recording time, and there is no USB connection for remote storage. Another footswitch can be used to stop playback, clear what you’ve recorded and also to tap out the tempo. The”Tap Tempo” feature is an impressive one, enabling you to change the tempo of files without changing the pitch. Tapping the tempo can be vital if you want to play together with one of those pre-made rhythm sounds. You can either tap the tempo on the pedal or on it’s button on the upper section of the pedal. This is as simple as it sounds, a light blinks to show what tempo you’re tapping out, and after it is right, just don’t tap anymore. Features Aside from a slick blue metallic casing, the pedal functions as a stereo device with two inputs and a pair of outputs. We are dealing with a true bypass pedal here, which is particularly significant with a loop pedal. The item weighs at 10.6 ounces and includes a total size of 4.6 x 3.2 x 2.1 inches. What is the main function of the DigiTech JamMan Stereo? The main function of the JamMan Stereo is looping. It features many looping features, but does not branch into other functionality (like adding FX). It’s simple and intuitive. Can I record sound, continuously play a loop of the recording, and then layer additional tracks over the loop/phrase with the DigiTech JamMan Stereo? Yes, the JamMan Stereo has fundamental looper performance with infinite overdub, controlled via footswitch. The process is to start recording, then < press Rec/Play/Overdub> to start looping what you have recorded, then to add your additional layer. You can continue to add to stop the playback. How long can I record with the DigiTech JamMan Stereo? The default JamMan Stereo can record 35 minutes, but it is possible to increase that to over 16 hours by using an optional SD/SDHC card up to 32GB. How many memory locations (slots) are included in the DigiTech JamMan Stereo? The default JamMan Stereo has 99 slots, but that’s expanded to 198 with the optional SD/SDHC card (up to 32GB). Employing the DigiTech JamMan Stereo, can I learn by having a tool teacher play something and then slow it down and work on fitting the notes and slowly speeding up? Yes, the JamMan Stereo has speed control (also known as Time Stretching), where you can slow down or speed up the music and it is an outstanding way to learn. Additionally, this is simple to accomplish, no learning curve required. Can I practice soloing with the DigiTech JamMan Stereo? Yes, you can lay down your own rhythm tracks and then play over the top of these, or you can use one of those 9 pre-loaded rhythm tracks. Or you can use the 1/8″ Aux Input to play a tune through the JamMan and then practice soloing over that. Can I use the DigiTech JamMan Stereo to catch quick song ideas to review later? Yes, this is a fantastic device for that and can store up to >16 hrs of your audio using an SDHC card. Can you switch to a different loop/slot while doing with the DigiTech JamMan Stereo? Yes you can, and it is very easy to do with the JamMan Stereo. Only press Loop Up or Loop Down footswitches to go to another slot. Can you perform loop-to-loop queuing with the DigiTech JamMan Stereo? Yes, the JamMan Stereo has this attribute. Loop-to-loop queuing is when you are playing a current loop/slot and you change to another loop/slot without quitting the current. Then, once the current loop finishes a playing cycle it automatically switches to the new loop you have selected. However, as pointed out in the comments of this video, by Albert Amman (who devised an accessory for the JamMan) when there’s nothing pre-recorded from the slot you switch to then it will only continue to play the current loop. This has also been noted in other forums. Can you change back to the previous loop with while doing with the DigiTech JamMan Stereo? You can only switch back to the previous loop if you’ve saved it by pressing the”Shop” button (not a footswitch) before switching to a different loop. We believe that you could do this without stopping the playback of the current loop. Also, there’s an after-market footswitch on Ebay that you can use to press the”Store” button with your foot (connection ), it’s known as a FABE. With the DigiTech JamMan Stereo, can I record and play unique sections of a song (verse, chorus, bridge) all during a live performance while not using my hands (pedals and footswitches only)? Yes, you could but you’d want to Store any loop if you wanted to come back to it later in the tune. This has to be done by pressing a button (not a footswitch), and we feel you could store the loop while in playback. Can I go from recording directly into overdub with the DigiTech JamMan Stereo? Yes, it is possible to go directly into overdub with the JamMan Stereo but it will require a double tap of the Rec/Overdub footswitch after you have recorded the first loop. Can I undo/redo the last overdub to change the tune or eliminate a recording error with the DigiTech JamMan Stereo? With the JamMan Stereo, you have the ability to undo the last overdub and redo the last undo. Can I adjust the quantity or effects of individual overdubs with the DigiTech JamMan Stereo? There are two inputs which can be recorded together with the JamMan Stereo — the Mic XLR as well as the stereo 1/4″ Instrument Inputs. Each of these have individual level control knobs. Therefore, there is some possibility for individual overdub volume adjustment. For effects, you can connect other external pedals before every input. Can I record individual overdubs/layers as individual WAV files to then utilize in a DAW? With the JamMan Stereo, we’re not aware of any method for individually recording overdubs/layers. Can I use the 1/8″ MP3/CD input to play song into the looper and integrate it into my loop with the DigiTech JamMan Stereo? Yes the CD/MP3 input can be selected to record with the looper. Can I pre-record tracks, edit them in a DAW, load them to the JamMan Stereo as loops and trigger them with the footswitch if needed? Can I play with multiple loops simultaneously with the DigiTech JamMan Stereo, and turn them on and off? By way of instance, play drums on one track, base-line on the other, and guitar on another and bring them in and out of this song? The only way you could partially accomplish this with the JamMan Stereo is with the reverse redo functionality. Can I play a loop or overdub in reverse with the DigiTech JamMan Stereo? Yes, there’s a button to allow for this function. As an alternative, you can purchase an optional FS3X Footswitch and do the function hands-free. Does the DigiTech JamMan Stereo have stereo sound or just mono? The JamMan Stereo has stereo sound. Is there anything in the DigiTech JamMan Stereo that reduces the clicking noise that could occur when tapping the footswitch during overdub? Not that we are aware of, and due to the audible noise the footswitches create when tapped, this can be an issue during recording — especially if the Mic picks up the noise. This is a weak spot. Is the DigiTech JamMan Stereo a Great looper for live performances on stage? We would urge other loopers for live stage performance. This version is better for home in our opinion. We like this model’s performance for writing new songs, editing, porting to a DAW, practicing, learning and movie performances. Are their multiple stop modes in the DigiTech JamMan Stereo? Yes, there are three stop modes — one stops the loop instantly when Stop footswitch is pressed, another ends out the loop prior to stopping, and the third fades the quantity to 0. Can you stutter start or DJ-scratch with the DigiTech JamMan Stereo? No, we are not aware of any way to stutter start or DJ-scratch with the JamMan Stereo unless you add those effects to a WAV file inside your DAW and then import via SD/SDHC card. With the DigiTech JamMan Stereo, are there any problems with droning (playing the same note, chord, repeated sounds, or tone-clusters always ) in the boundaries of these loops — such as noticeable change in volume? We’ve not experienced or heard of an issue with droning with the JamMan Stereo. Does the DigiTech JamMan Stereo possess a built-in metronome? Nine rhythm tracks are pre-loaded into the JamMan Stereo. You can adjust the tempo and use as a metronome. Is there any software that comes with the DigiTech JamMan Stereo? Yes, DigiTech provides free software Named JamManager for both Windows and Mac OS. With that program, you can transfer and organize loops, playlists, and adjust loop parameters. Is quantize performance available on the DigiTech JamMan Stereo? Yes, you can run the JamMan Stereo in free-form (without a quantize) or auto-quantize mode, where timing errors with loop start and stop are adjusted automatically depending on the user-defined tempo. Will the DigiTech JamMan Stereo port with my DAW (digital audio workstation)/computer through USB? The JamMan Stereo does not function as an audio interface. The USB is only used to transfer the loop documents, not stream the audio output to the DAW. Will the DigiTech JamMan Stereo port with my computer through USB to transfer audio files? Yes, the USB port on the JamMan Stereo is used to transfer documents. Many other loopers in the marketplace don’t have this functionality. Can I save and remember loops with SD card with the DigiTech JamMan Stereo? Yes you can use SD or SDHC cards up to 32GB to save and recall loops on the JamMan Stereo. Does the DigiTech JamMan Stereo have effects (FX)? No the JamMan Stereo does not have built-in effects (FX). Can I skip the effects (FX) using the DigiTech JamMan Stereo? No, this isn’t applicable to the JamMan Stereo since the unit does not have internal effects. Can I turn off or mute the live signal that’s fed via the DigiTech JamMan Stereo (for use in parallel effects loops of an amp or in Aux Send/Return of a mixer)? Yes, this function is controlled via button and is called”Dry Defeat”. If you do not use this function, you might have sound quality (phasing) issues. Can I save presets for consequences with the DigiTech JamMan Stereo? No, this is not applicable to the JamMan Stereo since the unit doesn’t have internal effects. Does the DigiTech JamMan Stereo have an XLR mic input? Does it have phantom power for a condenser mic? Yes, the JamMan Stereo has an XLR input, however it doesn’t have phantom power so that you can not connect a condenser microphone that needs phantom without an additional mic pre-amp (such as a Tube MP). Does the DigiTech JamMan Stereo function for a mixer with multiple inputs? Partially. There are three audio inputs: Mic XLR, Inst 1/4”, and Aux 1/8″. But, you can only record with either the Mic/Inst input or the Aux input, but not all at once. You choose the input through the”Record Mode” button. Can I re-assign footswitch performance with the DigiTech JamMan Stereo? The JamMan Stereo has four footswitches. One switch is used forand Undo/Redo, 1 forand Clear, and then two for picking the slot (memory location) –and. You can purchase an alternative FS3X that has three footswitches — you will do a quick Undo/Redo, another will perform the loop in reverse, and the third will allow temp adjust while the loop is playing. Does the DigiTech JamMan Stereo have a headset jack for playback and monitoring? Yes the JamMan Stereo includes a committed 1/8″ jack for headphones. Can the DigiTech JamMan Stereo be connected to an external MIDI device? No the JamMan Stereo Doesn’t have MIDI ports. Does DigiTech release firmware updates for the JamMan Stereo? Is there an optional footswitch that I can add to the DigiTech JamMan Stereo to increase performance? Yes, you can buy an alternative FS3X that has three footswitches — one will do a quick Undo/Redo, another will perform the loop in reverse, and the third will allow temp adjust while the loop is playing. Is there an optional expressional pedal that I can increase the DigiTech JamMan Stereo to control effects(FX)? No, there isn’t a way to connect an expression pedal to the JamMan Stereo. What’s the sampling rate and bit depth of the A/D/A transformation? For the JamMan Stereo, the A/D/A conversion is defined as 24-bit, 44.1 kHz. Can the DigiTech JamMan Stereo be battery powered? No there are no battery options for the DigiTech JamMan Stereo. How is the warranty for the DigiTech JamMan Stereo? 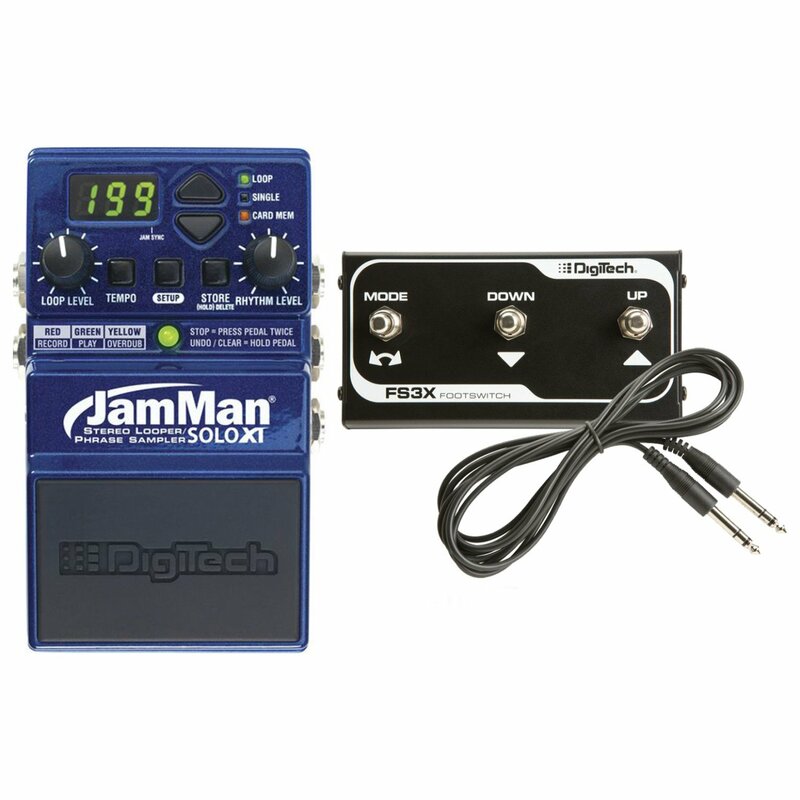 The JamMan Stereo includes a standard 1 year warranty through DigiTech. But this is expanded to 6 years if you register the product. This is a best-in-class warranty. What size is the DigiTech JamMan Stereo? The JamMan Stereo is rather compact. It weighs 2.22 lbs. It’s footprint is 6.8″ x 6.7″ and is 2.9″ tall. Also, keep in mind that the discretionary FS3X footswitch is 7.2″ x 4.8″ x 2.2″, and is considered essential by most. Why is using a DigiTech JamMan Stereo better than just using an iPhone or iPad program? There’s quite limited functionality using the iOS established loopers in comparison with the DigiTech JamMan Stereo. Nevertheless, these programs are quickly improving. With additional hardware (microphone, Bluetooth control pedal, etc. ), these setups might begin to look attractive. Please see our iOS app setup info. With regards to live performances, bringing an iPad or iPhone on point may feel more like a DJ performance, but it’s not going as far as bringing a laptop. Additionally, the OS may be more predictable and stable in contrast to an entire computer or workstation. Thus, we believe iOS based loopers will be stage-friendly than notebooks, but much less stage-friendly as pedals/stompboxes in the foreseeable future. What company makes the DigiTech JamMan Stereo and where are they found? DigiTech is located in Sandy, UT. They are owned by HARMAN International, which is a 13,000+ person company based out of Stamford, CT.
How is the service from DigiTech on any issues that arise with the unit? There is 1 guide for the DigiTech JamMan. Also, there’s a forum (known as the audio community) on their site which is essentially a forum for product discussions. A benefit to buying this loop is that it’s a extremely popular model (maybe with the highest market share), and therefore you have a lot of other people who understand how to use it. We’ve got the impression that DigiTech is easy to work with on warranty items, also. How long has the DigiTech JamMan Stereo been in production? According to the press release, it began to ship in April 2010. However, earlier versions of the JamMan were in production since 2005.